First, kudos to you for knowing that “synopses” is the correct plural of synopsis. Second, yes writing the synopsis for a Review of Old Comics is the hardest part of writing this column. That is not why I chose this particular preview comic for review. 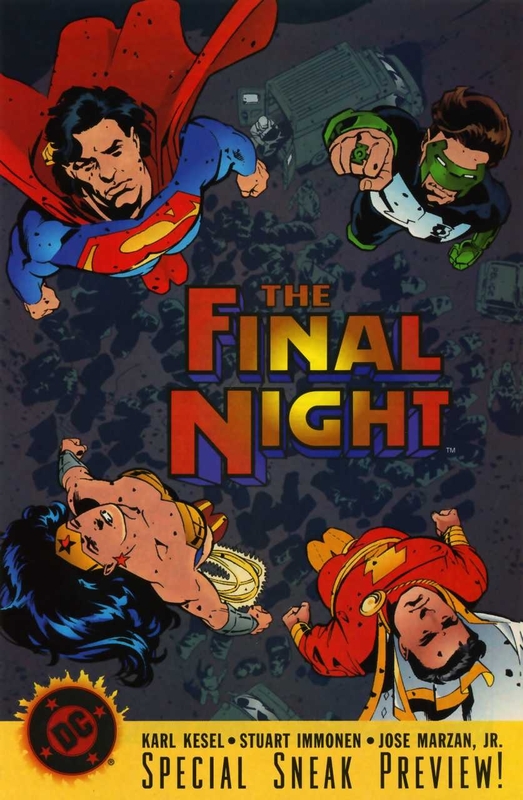 This was a case of DC’s promotional comic for the series featuring content not in the first issue of the series. It was eventually reprinted in the collection for the series, and colored to match the rest of the story. Originally, it wasn’t colored at all, printed in black and white. It also revisited a character that most readers may have forgotten about, Starfire. It picks up after Tamaran’s survivors settled New Tamaran, but teases us with a threat, but it doesn’t name it. On the planet New Tamaran, an unseen enemy has robbed the planet of its heat and light. Queen Komand’r brings forth an alien believed to be a spy. Her sister Koriand’r, known on Earth as Starfire, doesn’t believe this alien to be a spy. Without a translator, possibly destroyed by Komand’r, the alien has no way to communicate with Starfire. Komand’r asks her scientists to build a thermal tap to provide heat for New Tamaran to fight this unseen enemy. She also orders Starfire’s husband General Ph’yzonn to launch an assault on the giant monster the enemy has unleashed on New Tamaran. However, when they approach, all power drains from their ships and weapons, dooming everyone in the fleet. Enraged by the loss, Komand’r begins to torture the alien. Starfire rescues the alien and returns her to her ship. Starfire flees in a ship as well, since Komand’r orders them fired upon as they flee. Suddenly, the star goes nova and destroys the Tamaranean civilization. Arriving back on the charred planet, Starfire laments that she is the sole survivor and hopefully the next planet Dusk visits will heed her warning. That next planet is Earth, which detects Dusk’s spacecraft approaching. 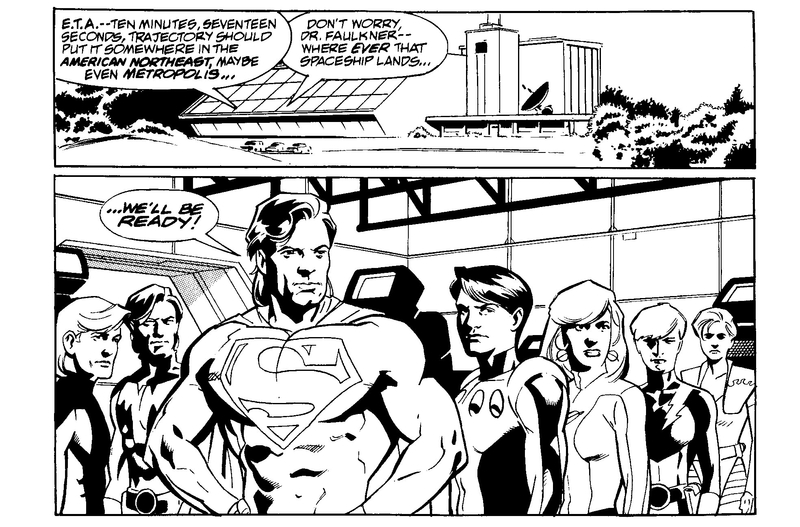 Superman and the Legion of Super-Heroes stand ready for anything. This is a great prelude to Final Night. As I recall, there was very little advance knowledge that Earth’s heroes would be facing a Sun-Eater. This preview doesn’t reveal that. It looks as if there might actually be a malevolent being behind the destruction of New Tamaran. After its revealed in the series that it’s a Sun-Eater just moving from star to star, Komand’r’s response is depressing in retrospect. We’re led to believe that all of Tamaranean society perished because their queen couldn’t see past her certainty that there had to be an attacker. Starfire’s status as the sole survivor lacks a little emotion to it. She seems almost too stoic, given that everyone she has known for the past couple of years has died horribly. The artwork being in black and white is nice, just to see Stuart Immonen’s work without the addition of color. At times it seems like it’s been drawn for color, since the scenes on new Tamaran don’t seem especially dark. It’s only through the captions and dialogue we learn of their particular plight. The last two panels, set on Earth, have similar lighting, and don’t feel any brighter than New Tamaran. Nevertheless, Immonen does excellent work, and his use of shadows gives everything weight and depth. His Komand’r and Starfire are excellent, although they look much older than they really should. His Superman is the stuff of legend, and I loved seeing him return to drawing the Legion after last doing so over two years prior in Legion of Super-Heroes #0. I seldom see this preview issue for sale, either at shops or conventions. However, finding it online shouldn’t take too much effort, but it might cost a premium. This issue has been collected in the collection of Final Night (ISBN: 978-1563894190). However it looks to be out of print, but with a little search in shops or at conventions, you might be able to grab a copy. In the collection, it has been colored, but for physical copies, you might come out cheaper buying the individual issues rather than buying the trade online. Of course, you can read the entire series online at Comixology, but sadly the preview issue isn’t there.